A 69 year old lady presents to the emergency department overnight with nausea, vomiting, and weight loss. This has been worsening for a period of weeks. She has now become confused and cannot tell you any of her past medical history. On exam, you notice a healed midline laparotomy scar and some right upper quadrant fullness. Apart from a temperature of 38.1 degrees celsius, her vital signs are normal. While waiting for blood test results, you decide to perform an abdominal ultrasound. What abnormalities are on this left upper quadrant image? 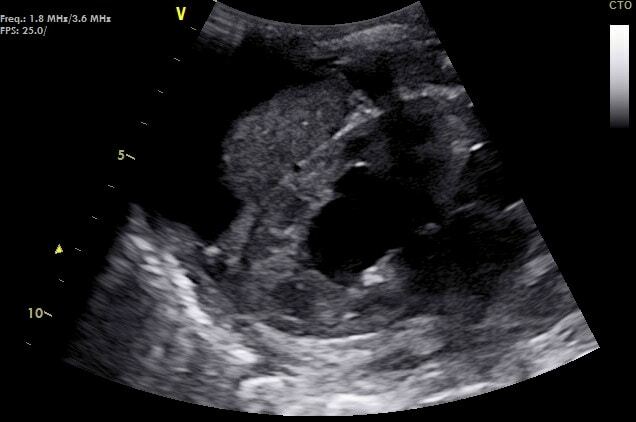 Moderate left sided hydronephrosis and hydroureter. Large volume free fluid around the spleen. 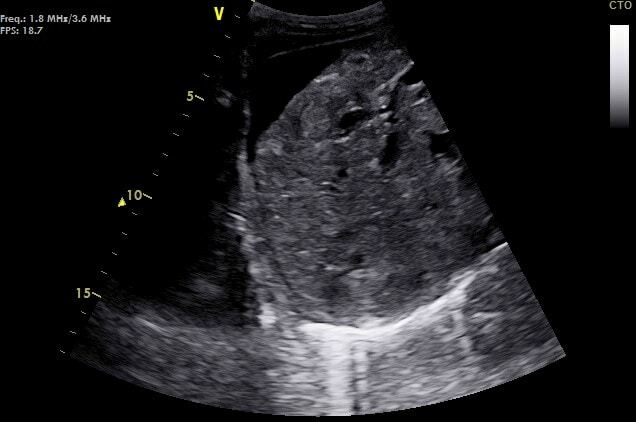 Coarse liver echotexture, likely related to either multiple metastases or cirrhosis. Intra-abdominal free fluid between liver and diaphragm. Small volume right pleural effusion. Based on this ultrasound, what is the most likely explanation for her presentation? Intra-abdominal free fluid in this context is most likely ascites secondary to peritoneal metastases. A definite cause for hydronephrosis is not demonstrated. However, in this clinical context, distal ureteric obstruction from a pelvic lesion is most likely. Finally, her pleural effusion may be due to either lung metastases, or hypoalbuminemia of malignancy. This lady had recurrence of colonic adenocarcinoma with hepatic and peritoneal metastases, although ovarian, renal cell or cervical carcinoma could also give a similar picture. Her confusion was caused by concurrent spontaneous bacterial peritonitis, which did not present with typical features of sepsis.